The user needs to select one or multiple folders that contain mp3 files at the beginning. 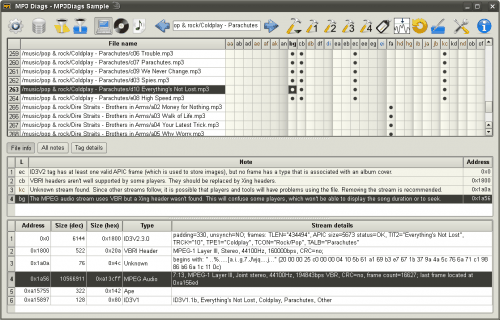 The program will automatically scan and analyze all mp3 files and display its findings in the main program interface. Each mp3 file is handled separately. It is possible to fix issues individually which could take a while depending on the size of the mp3 collection and the amount of errors found or to create a custom list that is fixing multiple errors (if they exist) at the same time. 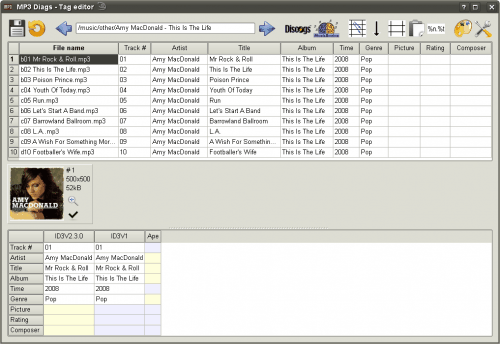 Mp3 Diag comes with a tag editor that can query online databases like MusicBrainz or Discogs for information about selected songs or albums. Other nice to have features are a file renamer, sorting options, mp3 backups before making changes and extensive options. Mp3 Diag is an excellent tool to scan and fix a mp3 collection. The open source tool is available for Microsoft Windows and Linux computer systems. Thank you soo much! I had a mess of tracks which need track names and artist name fixing! This tool worked amazing!